The story of autism contains many puzzles, but none more tantalizing than the problem of the eccentric individual who appears to be both intellectually gifted and mentally handicapped and who finds it difficult to deal with everyday social interaction and communication. Such individuals are increasingly recognized as suffering from Asperger Syndrome. 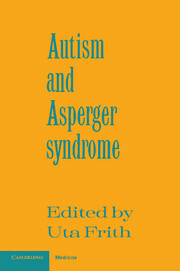 The argument presented in this book is that they suffer from a form of autism, but that they can compensate for this handicap to a remarkable degree. In this volume the foremost experts in the field discuss the diagnostic criteria of the syndrome, richly illustrated with examples from their clinical practices. Clinical accounts are balanced with personal accounts and some as yet preliminary research data. Asperger's classic paper is translated and annotated. The insights of this pioneer of autism have been unjustly neglected but reflect a very modern awareness of the many forms of autism and the wide range of individual differences in the men and women who suffer from this disorder. Asperger Syndrome individuals with their intellectual and linguistic ability and their desire for social adaptation are extremely vulnerable. List of illustrations; Acknowledgements; 1. Asperger and his syndrome; 2. 'Autistic psychopathy' in childhood; 3. The relationship between Asperger's syndrome and Kanner's autism; 4. Clinical and neurobiological aspects of Asperger syndrome in six family studies; 5. Asperger syndrome in adulthood; 6. Living with Asperger's syndrome; 7. The autobiographical writings of three Asperger syndrome adults: problems of interpretation and implications for theory; Name index; Subject index.